Food, good wine, great company. These are just some of my perfect ingredients for a happy life! Pair all of these with a beautiful location and a restaurant owner that has so much passion for these things it hurts, and you have a partttyyyyyy! A West St meal experience partyyyyyyyy. With Christmas just around the corner, I felt I needed to tell you about this beautiful restaurant near Colchester in Essex, as I think it would make a perfect venue for a Christmas get together. I also think that gifting someone, or a couple with a beautiful dining experience is a lovely christmas present in general, so have a look at your own local businesses if you are not local to Essex. This was another location that we were taken to on the press trip I was invited on last month, and its the utopia that is West Street Vineyard. 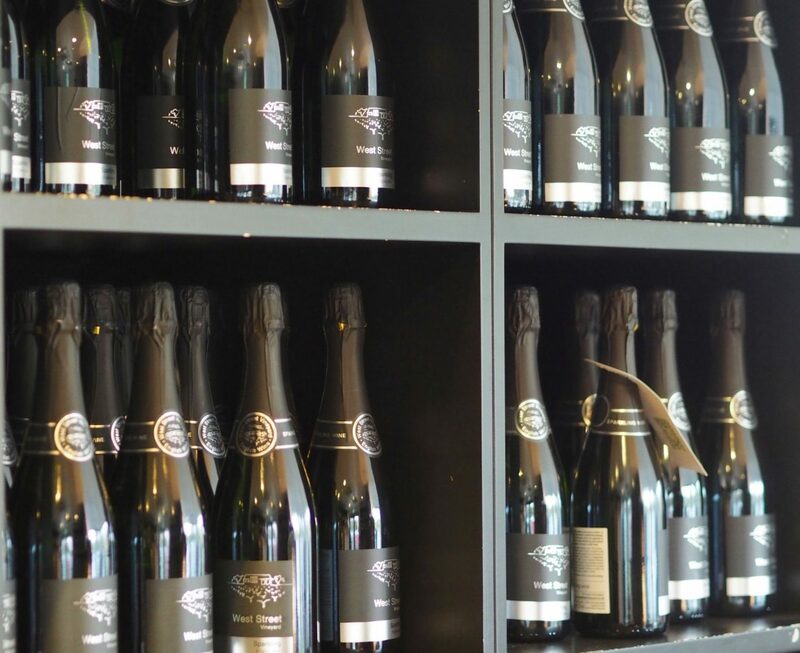 Located in the beautiful village of Coggleshall in Essex, we were taken here to learn more about the wines that West Street produce, as well as being treated to the most delicious lunch, more about the food later……. West Street Vineyards was bought by The Mohan family in 2009. Their vision was to combine their passion for excellent food and wine, and create an oasis offering the best of both. In 2011, after securing planning permission for the restaurant, they set about planting 3000 Chardonnay and Pinot Noir vines. The restaurant opened its doors for the first time in 2013. As I was learning very quickly, wine making really is a huge labour of love. The time and passion that the vineyard owners put into their wines was both admirable and inspiring. The joy and pride on the face of Jane, the owner of West Street, when she told us of the awards that the wine had won in 2017, was lovely. You really can tell that she wants to produce excellent wine to be enjoyed. We were given six wines to taste and learn about, and Jane was brilliant at helping us understand how wine should be served, enjoyed and made. I can honestly say I really liked all six. 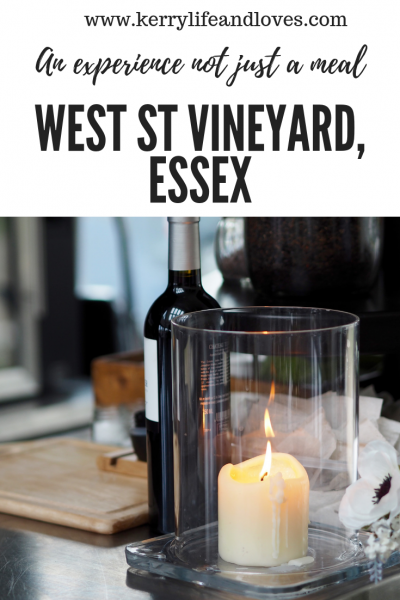 Wine, and locally sourced food is the ethos of West Street, and as well as beautiful menus, they offer courses to learn more about wine. The Saturday classes are relaxed events where you can learn more about wine making and matching wines to food. They are run throughout the year. 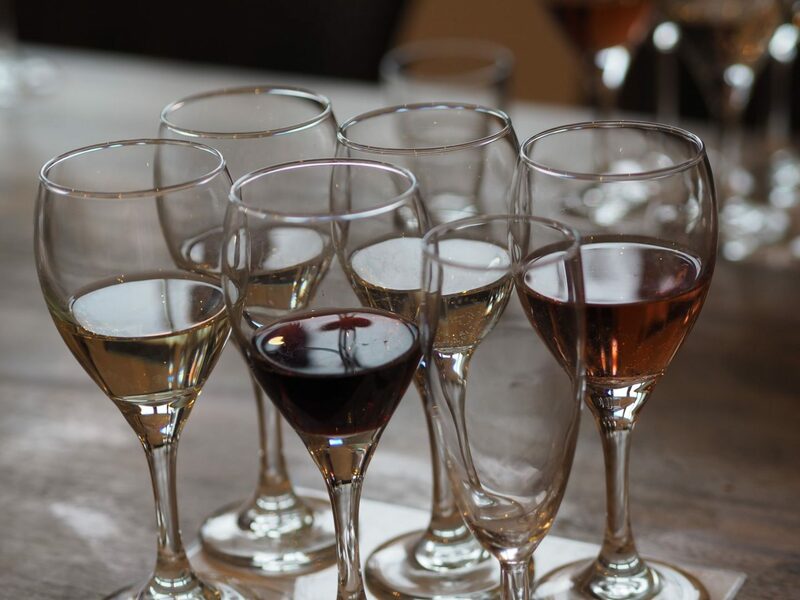 You can also do wine tasting at West Street, where you learn about 6 British wines and of course, get to try them all! The Resturant at West Street is amazing. It has far reaching views over the vineyard and surrounding countryside, and inside is bright, light and airy. It has a real modern feel to it, and everything is done with attention to detail and the customers experience in mind. It has an incredibly relaxed, welcoming feel to it and I am keen to return in the summer too, when you can enjoy the elevated outside seating areas, with gorgeous views. West Street also have events going on throughout the year, and is fast becoming a popular Essex wedding venue. The food here is absolutely amazing! It really is a treat. They offer a comprehensive menu, and you can have brunch, lunch, dinner, afternoon tea and Sunday lunch. We were served a three course dinner, and I promise you, it was wonderful. I am a non meat eater, so my starter was deep fried brie and it was amazing. My main was the most delicious butternut squash risotto, garnished with egg, and desert was the perfect finisher, raspberry sorbet and raspberry pannacotta. The meal was just amazing, and of course, Jane was on hand to recommend the wines that should accompany each course. I cant give enough credit to the meal, it was just beautiful. I really loved my experience at West Street Vineyards. The wines, the food, the venue all made this much more than just a meal. It felt like a fabulous experience, and I think doing the wine tasting first really added to this. Gift vouchers are available for West Street, and I think it would make an amazing present for someone. Whether its a lazy Saturday brunch, or a candlelit evening meal to celebrate an occasion, you cant go far wrong here. **Although my meal was complimentary, and in collaboration with Visit Essex, any views or opinions stated are my own. "Ten Things to Try to Do before we hit 2018"
That’s a little bit far for us, but it sounds like a lovely place to visit and have a meal. It makes such a difference when people are passionate about their work or about creating a great experience for visitors to enjoy the food and wine. Oh it really does Kirsty dosent it. I love to see that passion for their work. I cannot wait to go back, in fact, my husband read my blog post and now wants to go between christmas and new year. Lovely!